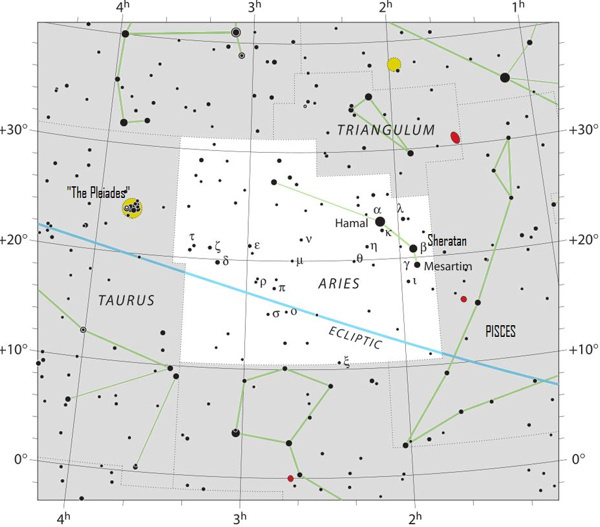 The sun – as seen from Earth – passes in front of the constellation Aries the Ram from about April 19 to May 14 every year. Of course, a Northern Hemisphere spring or Southern Hemisphere autumn presents the wrong time of year for viewing the constellation Aries because then the mighty Ram is lost in the sun’s glare. November and December are especially good months for viewing Aries. Follow the links below to learn more about how to see Aries in the night sky, and about this constellation in the history of astronomy and in mythology. What is the First Point of Aries? 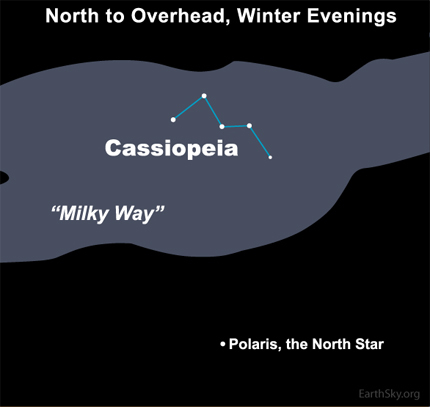 Look for Cassiopeia high over Polaris, the North Star around 8 p.m. local time in early December and 6 p.m. in early January. Then use Cassiopeia to star-hop to Aries by drawing an imaginary line from Polaris, the North Star, and through the star Segin (Epsilon Cassiopeiae). 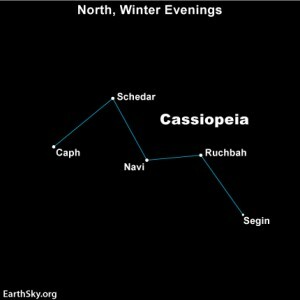 Not sure how to find the North Star with respect to Cassiopeia in December and January? This chart should help. Best time for seeing Aries the Ram. The best time to behold the Mighty Ram is at the opposite end of the year, when the Earth is on the other side of the sun. In late October, this constellation rises in the east at sunset, reaches its highest point in the sky at midnight and sets in the west at sunrise. November and December are especially good months for viewing Aries the Ram in all his starlit majesty, for this constellation shines above the eastern horizon at nightfall and stays out for most of the night. Aries culminates – reaches its highest point in the sky – at about 10 p.m. local time (the time in all time zones) in late November, 8 p.m. local time in late December and 6 p.m. local time in late January. 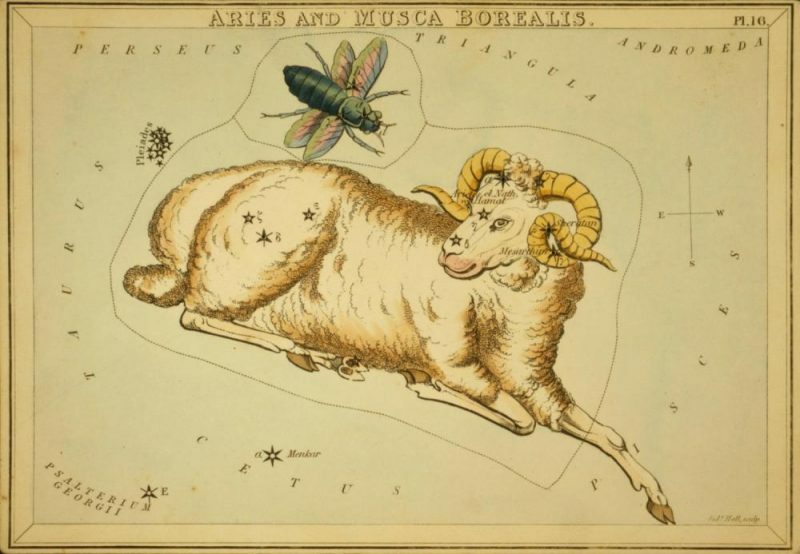 Aries is not a particularly prominent constellation, so a dark country sky absent of moonlight is most desirable for viewing the Ram at its finest. The three stars depicting the Ram’s bust – Hamal, Sheratan and Mesartim – suddenly brighten in a dark sky, as if someone had turned up the dimmer switch. By the way, a small telescope reveals that Mesartim is a double star. Fortunately, the head of the Ram is fairly easy to locate. You’ll find it midway between these two signposts: the Pleiades star cluster to the east and the Square of Pegasus to the west. The Ram’s head is actually turned backward, as if admiring the Pleiades – or perhaps his own golden fleece. You can also star-hop to Aries by drawing an imaginary line from Polaris, the North Star, and through a certain star in the constellation Cassiopeia: Segin (Epsilon Cassiopeiae). You’re seeking for the star at the east end of the famed starlit W or M, as shown on the sky chart at right. It’s a very long hop, more than twice the Polairs/Segin distance. Jump until you land between the Pleiades cluster and the Square of Pegasus. What is the First Point of Aries? The First Point of Aries marks the sun’s position in front of the constellations of the Zodiac on the Northern Hemisphere’s spring equinox or Southern Hemisphere’s autumnal equinox. 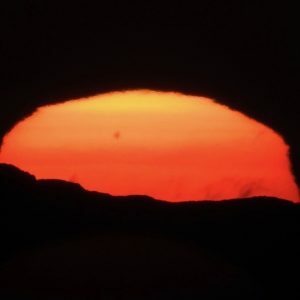 This equinox happens yearly on or near March 20, as the sun crosses the celestial equator, going from south to north. The First Point of Aries, which is actually in the constellation Pisces nowadays, defines the coordinate system on the celestial sphere. The First Point of Aries always coincides with 0o right ascension and 0o declination. 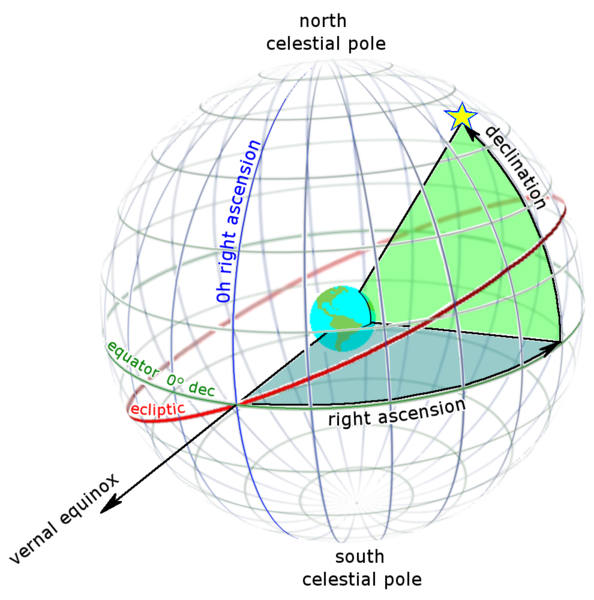 Right ascension is the equivalent of longitude here on Earth. Declination on the sky’s dome is the equivalent of latitude. The First Point of Aries is one of two places on the celestial sphere where the ecliptic and celestial equator intersect. The First Point of Libra resides 180o east of the First Point of Aries, marking the September equinox point on the celestial sphere. Because the Earth’s rotational axis wobbles full circle relative to the backdrop stars in about 26,000 years, Polaris doesn’t remain the North Star forever and the equinox points don’t remain fixed relative to the stars of the Zodiac. The March equinox point drifts westward (along the ecliptic) through the constellations of the Zodiac at about one degree (two sun diameters) in 72 years or 30o in 2160 years. Hence, the March equinox point passed out of the constellation Aries and into the constellation Pisces in 68 B.C. Even so, we still call this equinox point the First Point of Aries. 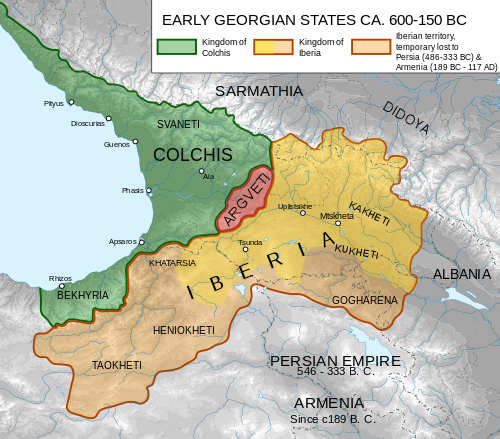 Map showing the ancient Kingdom of Colchis on the eastern shore of the Black Sea. View larger. Aries the Ram in star lore. In Greek mythology, Aries represents the supernatural Ram that was sent by Zeus to rescue the children of Athamus, the King of Thebes, from political intrigue. Phrixus and his sister Helle were about to meet their demise, but the flying Ram, which could both speak and reason, took them away in the nick of time. The children held on tight as the Ram flew them away for the safety of Colchis, an ancient kingdom bordering the eastern shore of the Black Sea. Unfortunately, Helle fell into the sea and drowned before reaching their destination. Hellespont – the ancient name for the Dardanelles straight near Istanbul, Turkey – marks the place of her death and was named in her honor. Phrixus survived the long trip to Colchis. He gave thanks by sacrificing the Ram to Zeus, hanging it in a sacred grove where the fleece turned to gold. Later on, Jason and the Argonauts recovered the Golden Fleece. 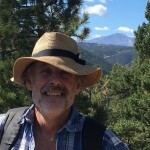 Bottom line: How to see the constellation Aries the Ram, plus info about this constellation in the history of astronomy, and in mythology.